The Nord Piano 4 88-Key Stage Piano builds on the success of the Piano 3 Stage Piano, boasting new performance features such as Seamless Transitions, new Piano Filters, Split Point Crossfades and more. 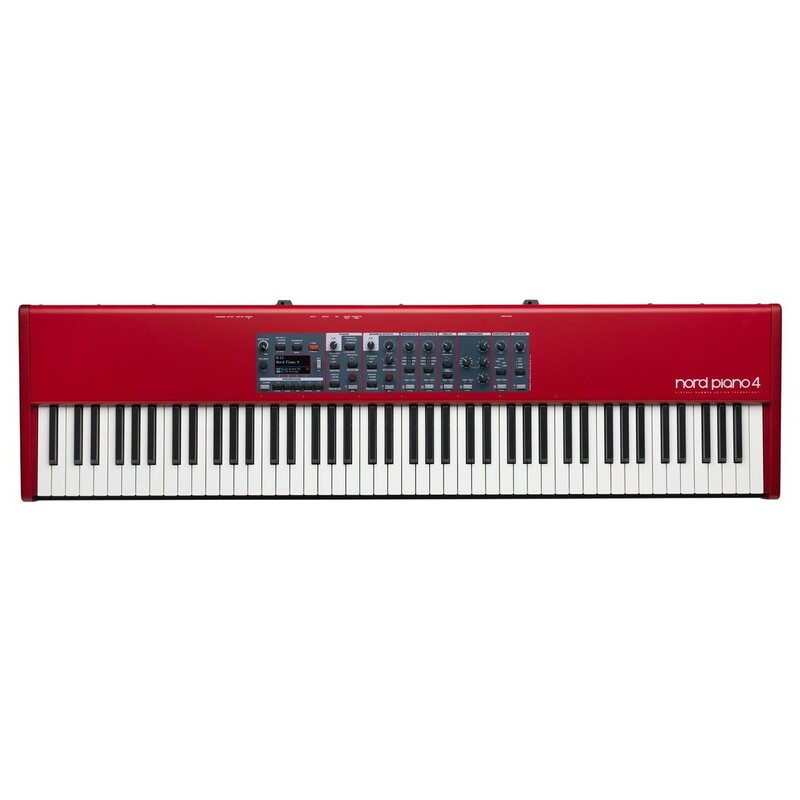 The Nord Piano 4 features an 88-note keybed with Virtual Hammer Action Technology providing fluid playability and natural, dynamic response. Piano 4 also boasts greatly expanded polyphony, now up to 120 voices, as well as a built-in factory bank including premium-grade soundbanks including the latest grand, upright, electric and digital pianos. The Sample Synth section has been upgraded with expanded memory (512MB), and the effect section has also been refined with a variety of high-end effects for added expression. The Nord Piano 4 88-Key Stage Piano is the latest addition to the award-winning stage piano series from Nord. 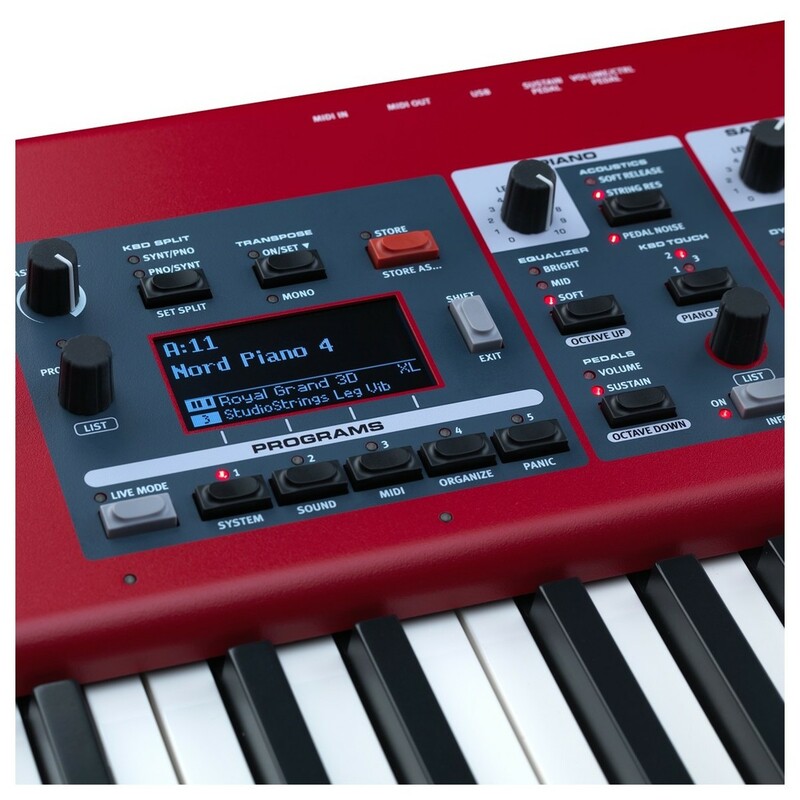 Nord Piano 4 builds on the success and the versatile design of the Piano 3, incorporating a range of new features and performance enhancements for improved functionality and playability. The backbone of the Nord Piano 4 is the Virtual Hammer Action Technology. This innovative custom tech from Nord simulates the hammer-action of a grand piano, providing unparalleled authenticity and fluid playability. The result is a natural and dynamic response delivering exceptional expressive capabilities. The Triple Sensor Keybed provides high-end precision when it comes to key movements, resulting in a natural and dynamic keyboard action with tight control. One of the most prominent upgrades to the Nord Piano 4 is the outstanding new performance features. When changing sounds or programs while playing, the Nord Piano 4 ensures seamless transitions, allowing you to switch between sounds without a noticeable change between programs. You can now also combine two sound sections in a layer or split over the keyboard. There are 7 split points in total, as well as new Split Point Crossfade abilities for smoother transitions between the split zones. The new and improved Organise mode includes quick and easy shortcut buttons for improving your workflow. The new mode features Copy/Paste and Move functions for quickly and easily rearranging your Programs. You can navigate between your Programs, Pianos and Synth Samples using the new List view, providing new sorting options in the form of alphabetical, numerical and category options. The new Numeric Pad Mode also allows you to enter the number of your Program for another way to navigate your sounds. The Piano Section has also been greatly expanded with brand new Creative Piano Filters, allowing you to accentuate softness, mid or brilliance for hands-on sound-design experience. Nord also employ their Advanced String Resonance and Dynamic Pedal Noise for the simulation of upright and grand piano sounds. 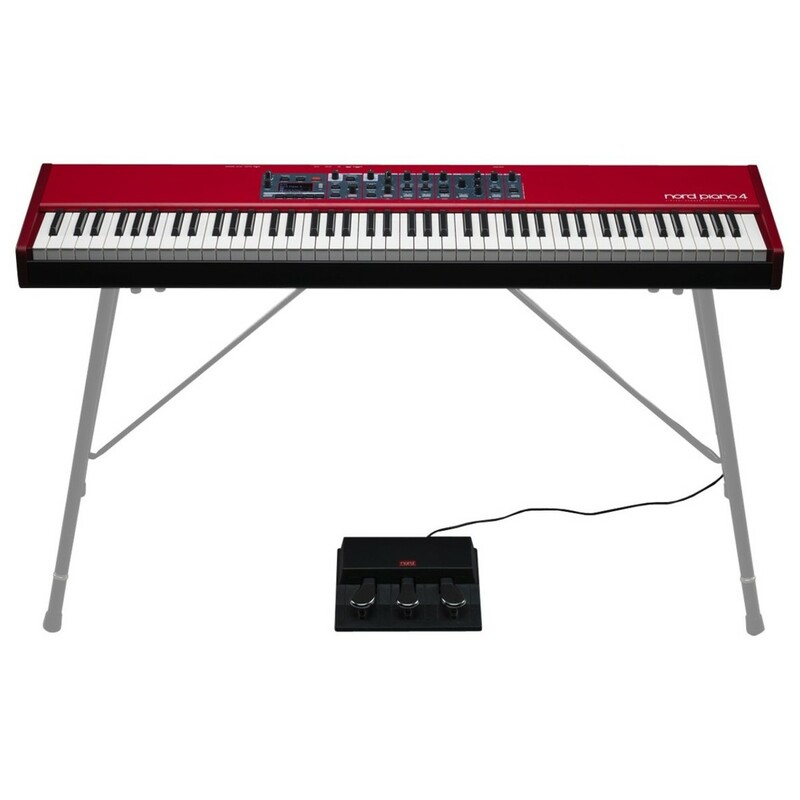 The Piano 4 comes complete with the Nord Triple Pedal allowing you to get the most out of the Dynamic Pedal Noise functionality, emulating the mechanical sounds of the pedal on a piano for added realism. The Piano 4 factory bank includes the latest grands, uprights, electric pianos and digital pianos from Nord’s Piano Library. Each style of piano and sound has been hand-picked for their unique characteristics, using Nord’s unique sampling technology to capture the character and nuances of the source instruments with exceptional authenticity. The Nord Library is constantly updated with new and breathtaking, world-class sounds. The Sample Synth Section has been upgraded from the Piano 3 to include expanded memory and extended polyphony. The Sample Synth Section provides an eclectic selection of premium-grade sounds from the Nord Sample Library 3.0 includes exclusive sounds from legendary Mellotron and Chmaberlin synths. The memory has been expanded to 512MB, which is double that of the Piano 3. The polyphony has also been extended, providing up to 120 voices in the piano section and vastly expanded polyphony in the synth section. The effects section of the Piano 4 boasts a wide range of premium-grade FX which you can combine and adjust to suit your requirements. They include high-end stereo effects modelled after vintage stomp boxes and can be assigned to either the piano or sample synth section. The effects includes: Tremolo, Phaser, Chorus, Pan, Wah, RM, Flanger, Vibe, EQ, Delay and Reverb with a new Bright Mode. Download 6 extra EP patches created by Grammy award-winning keyboardist Ondre J Pivec here.